Green Team Gazette: January 10th, 1992: Rubber Ducky, You're the One! January 10th, 1992: Rubber Ducky, You're the One! However, if you were in a ship in the Pacific Ocean at 44.7°N, 178.1°E, you were in the middle of a storm on a cargo ship. You also would have been fretting over several lost cargo containers carrying approximately 29,000 bathtub toys. Of those, there were a boat-load of blue turtles, a gaggle of green frogs, a bevy of red beavers, and a passel about 7,000 yellow plastic rubber ducks. 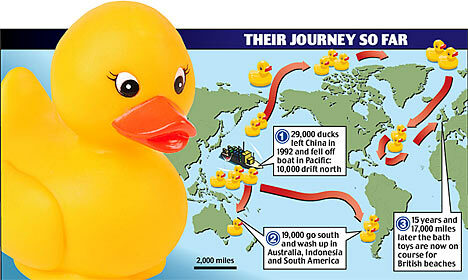 So January 10th, 1992 the Plastic Rubber Ducky fleet set sail. 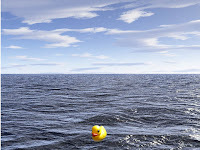 At the time, and given the circumstances, scientists took advantage of the opportunity to follow these yellow fellows to monitor the currents of the North Pacific Gyre. Sightings started in Alaska in November 1992. The beaches of Washington, Alaska, and Canada were among the first to catch these visitors, but later others traveled through the Bering Sea and up to the Arctic Ocean, while others went as far south as Australia and South America. Members of the fleet were still occasionally popping up even in 2003! 1. It's estimated that 10,000 cargo containers go overboard every year. This is called jetsam. Things that float, things that don't. Famous other finds include the spillage of 80,000 Nike shoes, 34,000 hockey gloves, and 4+ millions of pieces of Legos. Splash! 2. 19 years later (i.e. : today), most of those plastic ducks, frogs, beavers, turtles, and other tub toys have probably landed somewhere or other upon the drift of the currents. 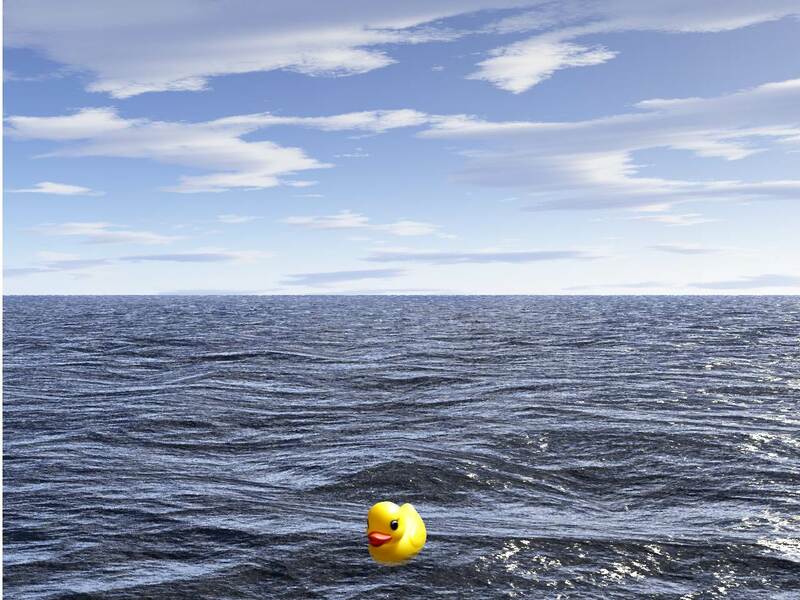 However, odds are there are other rubber duckies (and such) still out there, in the one oceanic gyre or another, degrading. The tiny fragments that break off due to the elements of wind and waves, salt water, sun damage, and more are called nurdles. They're bite-sized bits start contributing to the plastic vortex of toxic soup, that's makes for measly meals for the marine wildlife that lives there. 3. North Pacific Gyre? Gee that sounds familiar. Oh wait--the Great Pacific Garbage Patch is there. You know the one--the one filled with all the above-mentioned plastic pollution. "Imagine a handful of degraded plastic confetti spread across a football field of the ocean surface. That’s as thick as it gets, but it’s everywhere. It’s a thick plastic soup over 2/3rds of the earth’s surface. So far the 5 Gyres Institute has traveled to 4 of the 5 subtropical gyres in the world, conducting over 400 surface trawls, with plastic in every one. That is the menace of plastic pollution. 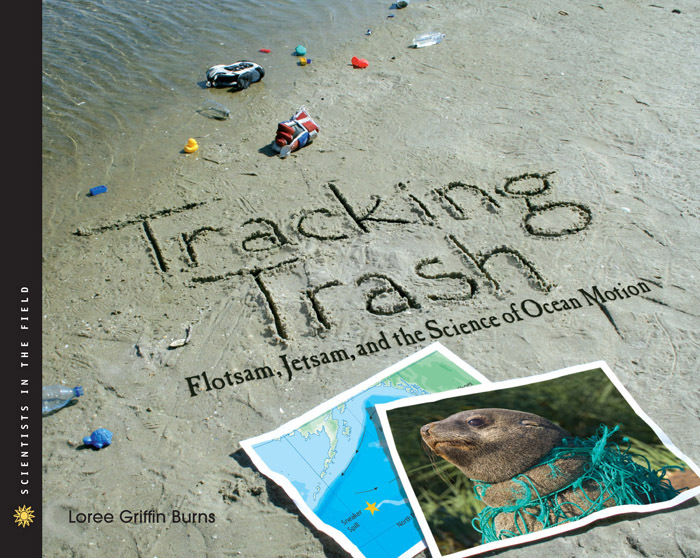 It’s everywhere, thinly distributed, and extremely impractical to clean up at sea." So, hmmmmm....What to do, what to do? 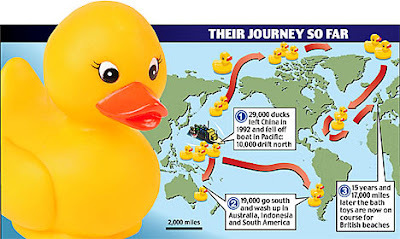 Go to www.seabean.com, click on "Other Things That Float" then click "Plastic Duckies" for a wealth of links to learn more. For littler youngsters, share Eric Carle's book 10 Little Rubber Ducks which was inspired by these overboard yellow fellows and the encounters they have. Research some of the sightings of these famous floaters, and have students put their mapping skills to work studying latitude and longitude. What can your young scientists learn from this scientific study of currents. Use it as a springboard to discuss the importance of making sure that plastic trash doesn't end up in our waterways to begin with! !